There's nothing more I love than a good skincare routine. It's around the months of May/June when University exams take over,so I find myself taking time out on the evening to pamper myself. Not only does this relax me but also avoids the 2 hours sleep I've had from the previous night showing. The latest of my skincare ventures was with the brand Anatomicals. I've heard of Anatomicals before and have previously used their Puffy The Eye Bag Slayer Wake-Up Under Eye Patches on nights out. And as the saying goes, once you find something that works - stick with it. As I was so eager to try more of Anatomicals products, the PR team kindly sent me some over. There's no denying the one thing that stands out about their products is the amazing packaging. 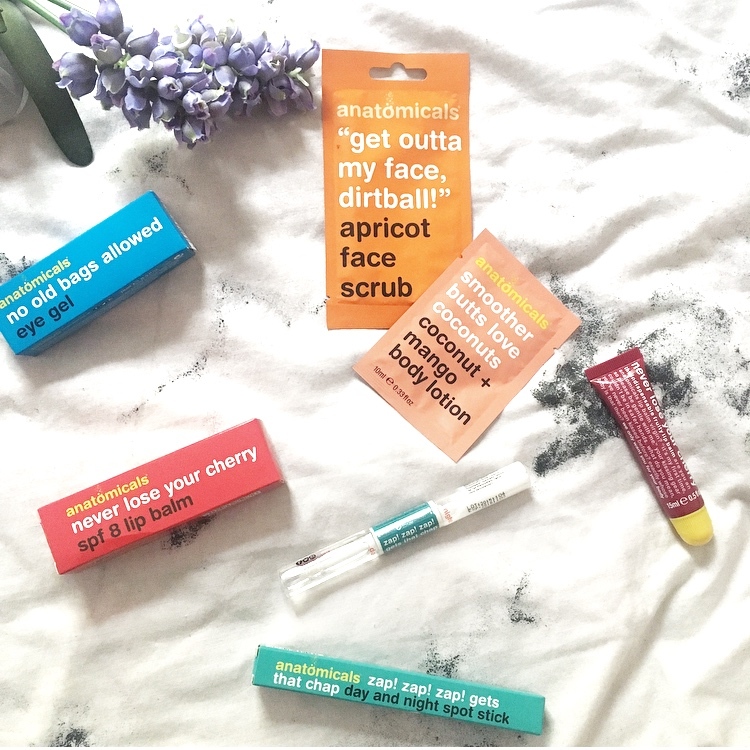 Anatomicals claim to 'manufacture the world's funkiest toiletries' - and that they do! Lets take a minute to appreciate these amazing tongue-in-cheek product names. I love how quirky the brand is and best of all its affordable starting from just £3. I feel like facial scrubs have lost the recognition they deserve. 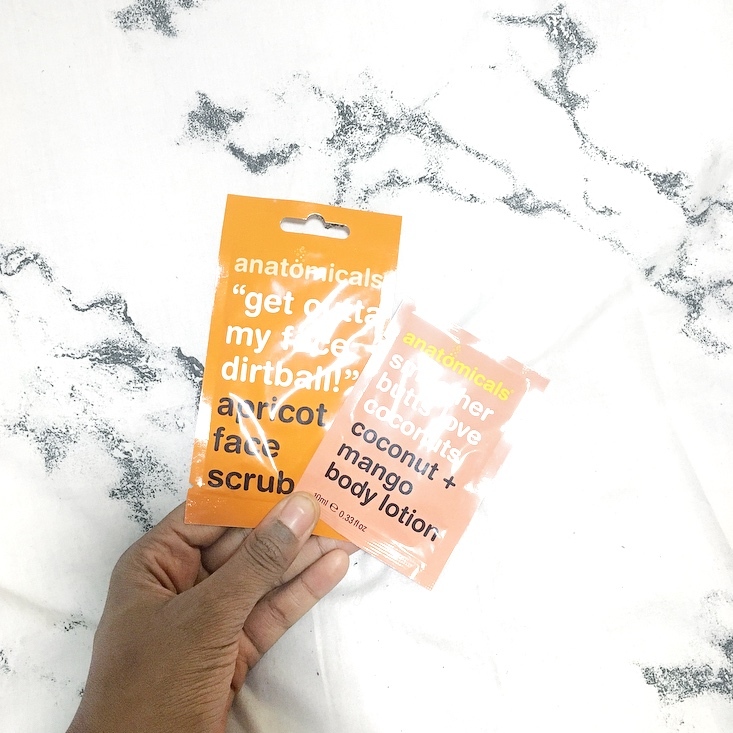 With clay masks and peel off masks taking over, the traditional scrub mask will always have a place in my heart. Firstly, this Get outta my face dirtball apricot face scrub smells great! Anatomicals are paragon free and use only the best ingredients, so don't have any chemically smells. The ingredients are also all free from animal testing so if the smell doesn't win you over, that will certainly do so. And the exfoliation I got from this mask was incredible - my skin felt so smooth and hydrated after I washed it off with warm water. The only thing I can complain about regarding the coconut and mango body location was that there wasn't enough of it. Although 100ml is a good size if you're travelling. 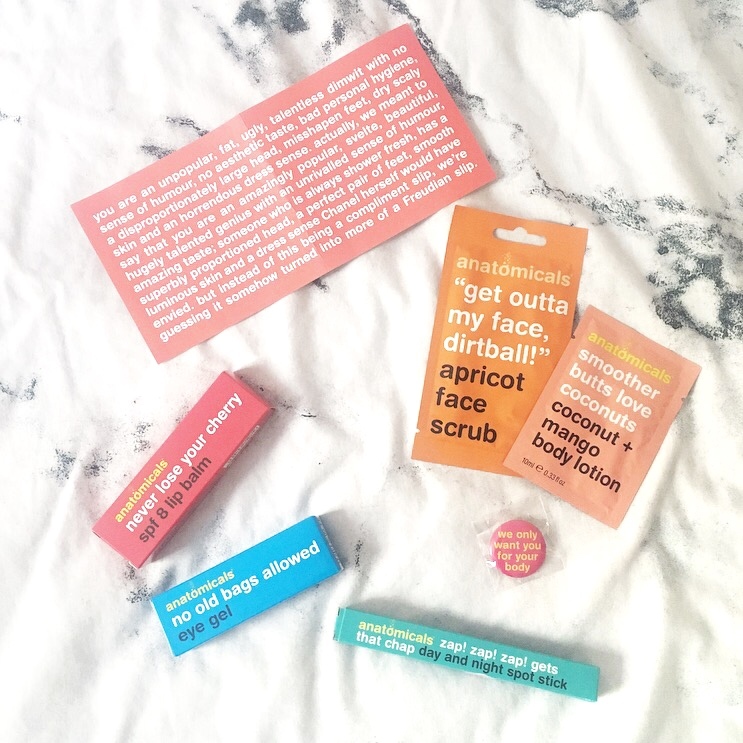 Another great thing about Anatomicals is the fact they do a Look Hot & Globe Trot travel set with all the essentials required to keep looking fresh on any type of trip - something I will certainly be purchasing this summer. Night And Day Spot Zapper religiously. I love the fact that it has a day and night option as with a lot of other spot serums - I'll put it on in the night then still wake up with the spot in the morning and just cover it up with makeup in the day, without really addressing the problem. But with this miracle wand, I found that the aggravation of the spot reduced almost instantly as it brought bacteria to the surface(look at me getting all zit term technical). If you wear quite a lot of matte liquid lipsticks, then you will know they can be quite drying so one thing which I'm always on the hunt for is a good lip balm(I seriously have about 3 in my bag, but can never find one when I need one). 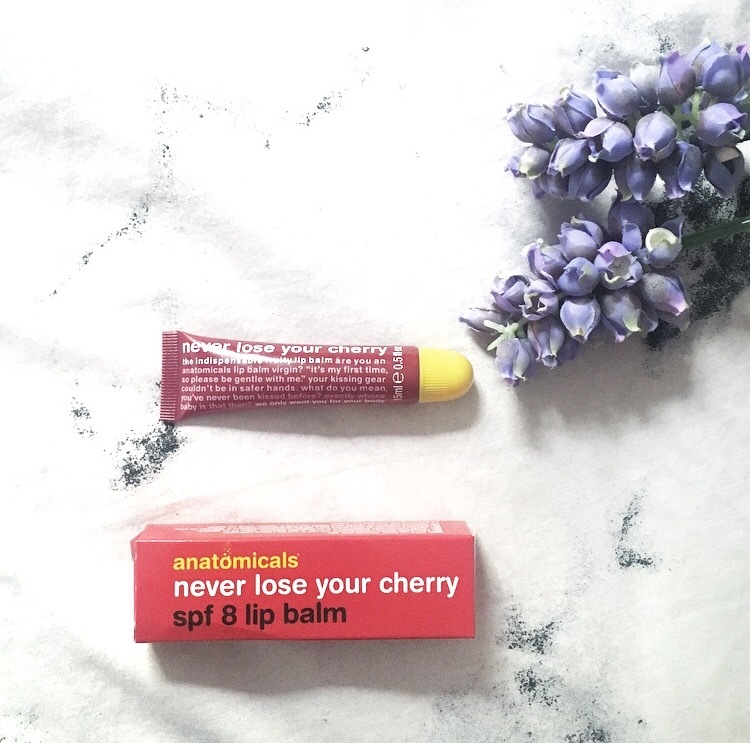 When something says 'balm' you don't expect the texture to be glossy - but I was pleasantly surprised by the never lose your cherry lip balm. The fact that it has SPF in and stays on your lips for a long time leaving them look looking plump and soft also goes down a treat. 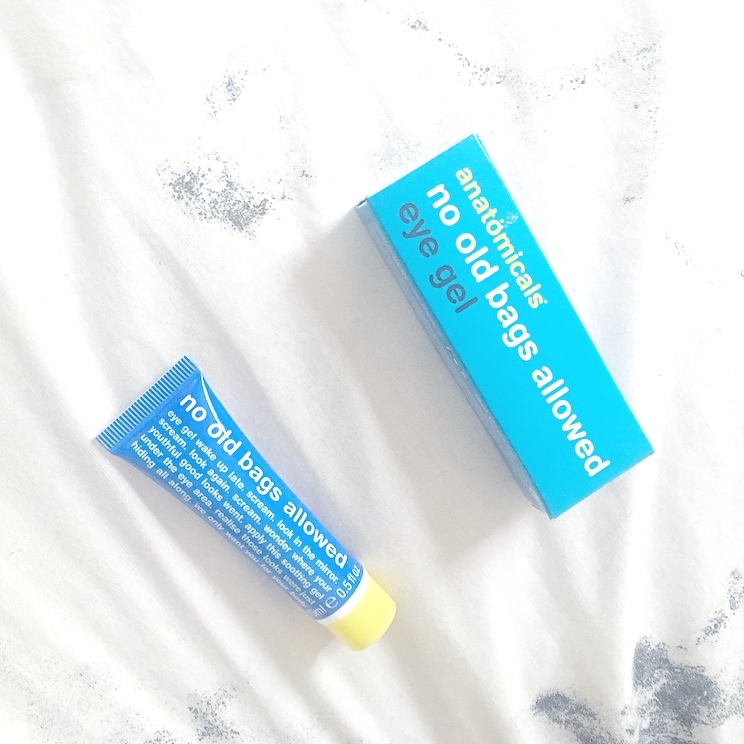 After relying on the Puffy The Eye Bag Slayer Wake-Up Under Eye Patches for a number of years, I wanted to 'upgrade' and try the No Old Bags Allowed Eye Gel. With this product a small amount goes a long way. The refreshing, light, non-greasy eye gel contains arnica and orange flower water – both essential ingredients for wide eyed. But it wasn't really an upgrade as this product is just as great! After a couple of 19 hour days trying to get my last piece of University work done, this was thoroughly needed. It is also great to use under make up as it sinks into the skin almost instantly whilst de-puffying any eye bags. So generally, Anatomicals have some pretty amazing products with some pretty cool packaging. You can find Anatomicals for sale at Superdrug and ASOS.com. They also have a fantastic set of social media pages for you to check out. 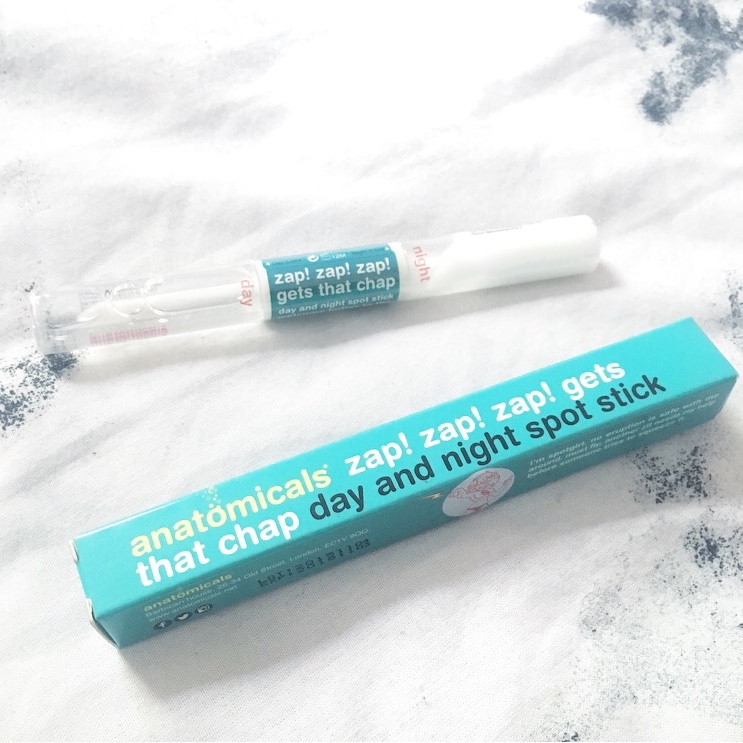 Have you tried Anatomicals before and recommend a product that you can't go without? Comment below! NB: This post was a collaboration with Anatomicals. However all opinions are honest and my own.